Facebook has become one of the most popular websites on the planet in just a matter of few years. Millions of people spend hours of their time communicating with others and sharing videos and pictures with their friends. If you happen to follow a lot of people on Facebook, you realize that it’s so easy to miss some of the updates that people are making on Facebook. Whether you are a Facebook page owner or just want to get more attention for your status updates, using symbols could help you achieve your goal. That’s where Facebook Symbols comes in. It’s a cool little Facebook application for iPhone that enables you to add all kinds of symbols to your status updates on the go. The application is pretty easy to use and fun to play with. 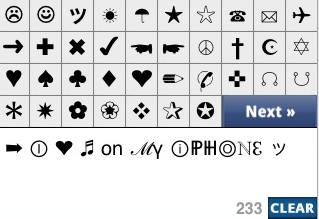 It comes with 244 symbols that you can add to your status updates and share with your friends. The app supports multiple accounts as well, which is a plus. Facebook gives you the ability to connect and network with millions of other Facebookers. If you are looking for a creative way to share information with your friends, Facebook Symbols can come in handy.